This article is about the town. For the electoral district, see Battleford (electoral district). For other uses, see Battleford (disambiguation). Battleford (2011 population 4,065) is a small town located across the North Saskatchewan River from the City of North Battleford, in Saskatchewan, Canada. Battleford and North Battleford are collectively referred to as "The Battlefords" by Saskatchewan residents, as well as on highway signage. Although there has been occasional talk of the two communities merging, as of 2012 they remain separate entities. The local economy is fuelled mainly by agriculture. Battleford is bordered by the Rural Municipality of Battle River No. 438, as well as by the city of North Battleford and a small section of the Rural Municipality of North Battleford No. 437. The 1973 western Alien Thunder was partially filmed in Battleford. The Battleford area was the site of numerous independent and Hudson's Bay Company fur trading houses dating from the 1770s. William Holmes operated a post for the North West Company just above the confluence of the Battle and Saskatchewan rivers in 1784. At least three posts were in use between 1868 and 1914. The town was founded in 1875 as a fur trading post and North-West Mounted Police (NWMP) fort. Its post office opened in 1877. Between 1876 and 1883, Battleford was the territorial capital of the North-West Territories (now Alberta, Saskatchewan, Nunavut, northern Quebec, northern Ontario and the Northwest Territories) and the NWMP fort (Fort Battleford) located there played an important role in the 1885 North-West Rebellion. On March 30, 1885, during the North-West Rebellion, the town of Battleford was looted by a party of Cree people, who were short on food due to declining bison populations. When the Cree approached Battleford, the 500 residents fled to the nearby North-West Mounted Police post, Fort Battleford. The Crees then took food and supplies from the abandoned stores and houses. The Battleford Land Registry Office built between 1877-1878 is the last remaining building on Battleford's Government Ridge that dates from the Territorial era. Other heritage buildings include the District Court House, the Town Hall / Opera House, the Former Land Titles Building, The Station Building, the Fred Light Museum (St. Vital School), St. Vital Church, Gardiner Church and the Former Bank of Montreal Building. The local newspaper is The Battlefords News Optimist. It is published weekly on Wednesdays and Fridays, and has circulation in the surrounding area. Three local radio stations serve the area; CJNB, CJCQ-FM ("Q98"), and CJHD-FM ("93.3 The Rock"). Some Saskatoon radio stations can also be received. The Battlefords are served by CFQC-TV-2 channel 6, an analogue repeater of CTV station CFQC-DT Saskatoon. ^ National Archives, Archivia Net. "Post Offices and Postmasters". Archived from the original on 6 October 2006. Retrieved 6 September 2009. ^ Government of Saskatchewan, MRD Home. "Municipal Directory System". Archived from the original on 15 January 2016. Retrieved 6 September 2009. ^ Voorhis, Ernest (1930). "Historic Forts of the French Regime and of the English Fur Trading Companies". Historic Forts of the French Regime and of the English Fur Trading Companies. Govt. of Canada. Retrieved 2016-04-28. ^ Ray, Arthur. "William Holmes". Dictionary of Canadian Biography. University of Toronto/Universite Laval. Retrieved 2016-04-28. ^ Morton, Arthur (1973). A History of the Canadian West. University of Toronto Press. pp. 337 ff. ISBN 0-8020-4033-0. ^ Martz, Lawrence (et al) (2000). Atlas of Saskatchewan (CD edition). Saskatoon: University of Saskatchewan. Map of Trading Posts pre 1759 - post 1930. ^ "Battleford". Encyclopedia of Saskatchewan. Canadian Plains Research Center, University of Regina. 2006. Retrieved 2013-12-08. ^ "2011 Community Profiles". 2011 Canadian Census. Statistics Canada. July 5, 2013. Retrieved 2013-12-09. ^ Fort Battleford. Canadian Register of Historic Places. Retrieved 2013-12-07. ^ Battleford Court House. Canadian Register of Historic Places. Retrieved 2013-12-07. ^ Old Government House / Saint-Charles Scholasticate. Canadian Register of Historic Places. Retrieved 2013-12-07. ^ Government House, Battleford. Canadian Register of Historic Places. Retrieved 2013-12-07. ^ Battleford Land Registry Office. Canadian Register of Historic Places. Retrieved 2013-12-07. ^ District Court House. Canadian Register of Historic Places. Retrieved 2013-12-07. ^ Town Hall / Opera House. Canadian Register of Historic Places. Retrieved 2013-12-07. ^ Former Land Titles Building. Canadian Register of Historic Places. Retrieved 2013-12-07. ^ The Station Building. Canadian Register of Historic Places. Retrieved 2013-12-07. ^ Fred Light Museum (St. Vital School). Canadian Register of Historic Places. Retrieved 2013-12-07. ^ St. Vital Church. Canadian Register of Historic Places. Retrieved 2013-12-07. ^ Gardiner Church. Canadian Register of Historic Places. Retrieved 2013-12-07. ^ Former Bank of Montreal Building. Canadian Register of Historic Places. Retrieved 2013-12-07. Wikimedia Commons has media related to Battleford, Saskatchewan. 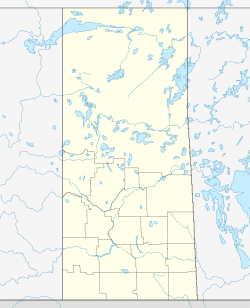 Wikimedia Commons has media related to North Battleford, Saskatchewan.